For 2015 The Columbus Saints are proud to present their production “The Age of Swing” – featuring the music of the Harlem Renaissance. Showcasing Stompin At The Savoy popularized by Chick Webb and Ella Fitzgerald,; Sing Sing Sing! performed by Benny Goodman, and It Don’t Mean a Thing (If It Ain’t Got That Swing) as performed by Duke Ellington. Our 2015 Production centers around the Savoy Ballroom and it’s most famous band leader Chick Webb and his famous drum battles! Jazz music is truly one of the only original forms of music created in America. Born out of the rich history and culture of African-Americans and the cultural explosion tipped off by the end of the World War I, Harlem was the cultural epicenter of America. Out of this grew a new movement showcasing the creative talents of African-Americans in art, literature, film, and other mediums affectionately referred to as “The Harlem Renaissance“. A new style of music SWING was born and pioneered on the streets of Harlem burning up the dance halls across the neighborhood. Once such dance hall was the Savoy Ballroom which was one of the first racial integrated venues that employed two bands; and was affordable for all. The Savoy became the home of artists such as Chick Webb who was know for his flair and ability to excite the crowd who later discovered Ella Fitzgerald. New dances such as the Lindy Hop were born out of the Savoy Ballroom which eventually became one of the meccas of dance and music in Harlem. 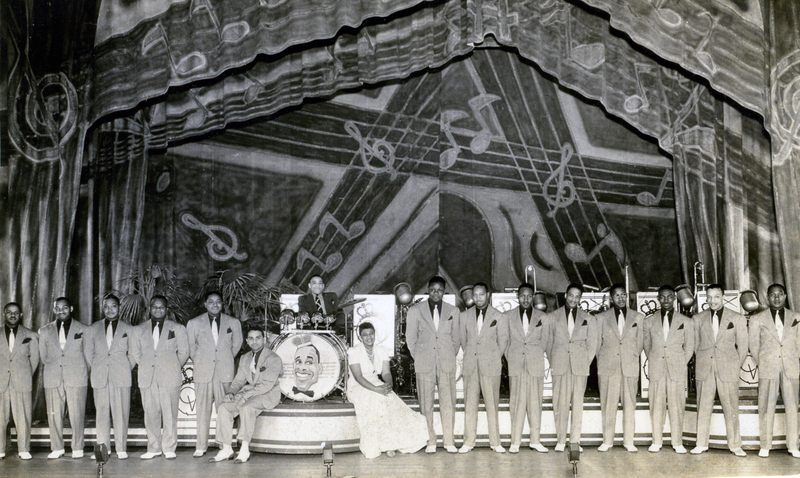 At the Savoy Ballroom Chick Webb and his Orchestra provided toe-tapping performances that kept audiences coming. Always the bandleader and promoter Chick Webb began having events titled “BATTLE OF THE BANDS” against such artists as Duke Ellington, Benny Goodman, Count Basie and more! These events often featured both bands playing the same arrangements often with Chick Webb’s Orchestra playing faster and with high energy. In a famous battle against Benny Goodman’s Band; Drummer Gene Krupa stated “Chick ripped me to ribbons”, leading to Chick Webb and his Orchestra being titled “The King of Swing“. More battles came and with the energy and fervor of the crowd Chick Webb prevailed more often then not with his signature brand of drumming that influenced greats such as Buddy Rich, Louie Bellson and Gene Krupa. With our 2015 the Columbus Saints worked to honor this great era but also educate our fans and our community on the importance of the Harlem Renaissance, Swing Music. Partnering with local performing ensembles we’ve been able to not only educate our members but also appreciate the culture in a manner that is respectful to those who helped create it. To learn more begin with the documentary titled “Ken Burns Jazz” which explores it’s history.